Happy Sunday everyone! Are you doing anything special for Memorial Day? Sadly, I'll be working. 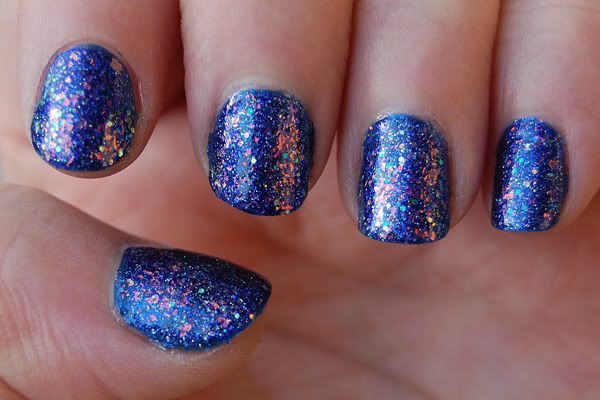 To cheer myself up, I decided to do some cosmic inspired nails. You may or may not know this, but I'm really into astronomy and cosmology. I spend a lot of time thinking, reading and learning about the universe. It's a really beautiful, fascinating place. In my opinion, some of the most beautiful celestial objects are supernova remnants and planetary nebulae. If you've never looked at a composite image of nebula, you're really missing out. 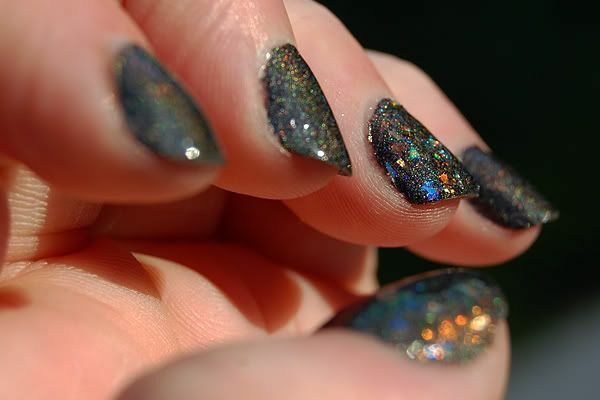 For this mani, I took inspiration from Kepler's Supernova. 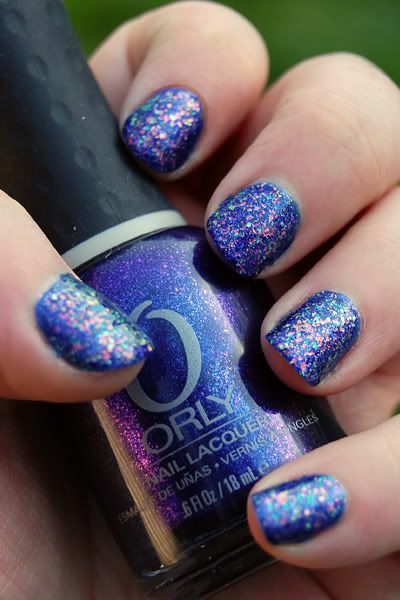 I used two coats of Orly Lunar Eclipse then layered one coat each of Sinful Colors Hottie and Nubar 2010. Of course I had to top it off with a coat of Essie Matte About You. 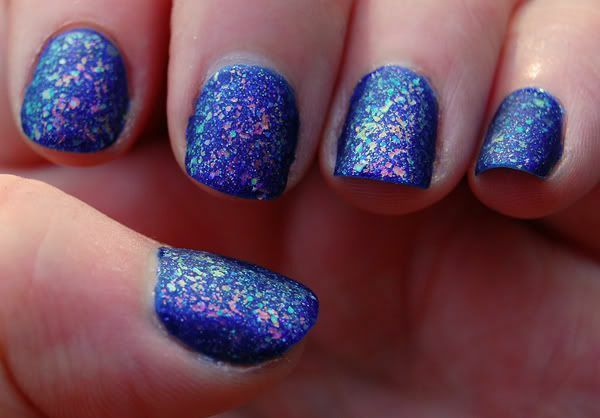 I'm seriously obsessed with mattifying glitters right now, lol. Please excuse my dry hands/fingers/cuticles, I worked today so I was washing them constantly! Plus, I'm out of Lemony Flutter, ugh. Expect a FOTD soon! I've been meaning to post this NOTD since Friday, but every day I do something to jack up my nails or I run out of daylight and can't take photos. I've reapplied this same manicure everyday since Friday, I love it that much and have wanted to keep it looking fresh. Now, I still haven't gotten the hang of photographing my nails, so I apologize yet again. I'm a bit of a perfectionist and it actually irks me to no end that my photos aren't coming out how I want them to. Oh well, I'll figure it out eventually! 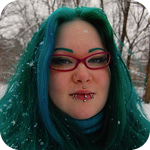 Alright, enough yappin', on to the pics! So here's what I'm working with! 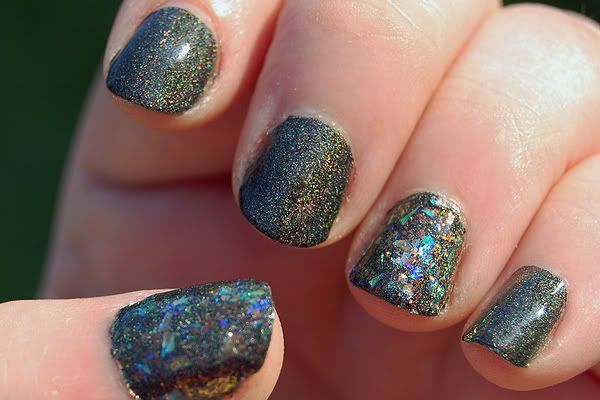 Color Club Revvvolution, Covered in Diamonds and Nubar 2010. 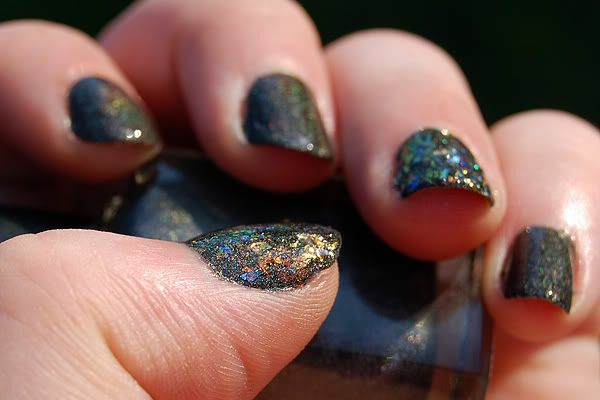 Color Club Revvvolution is black polish loaded with holographic glitter. 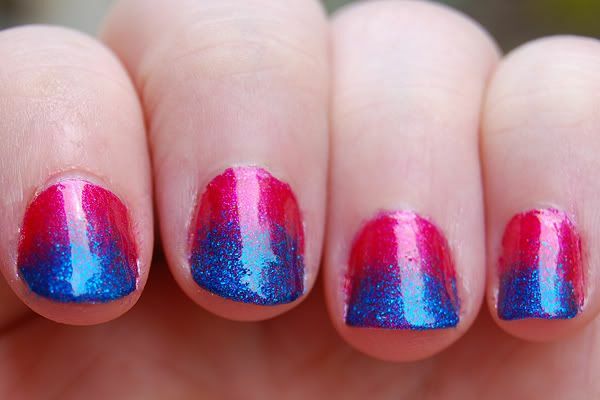 It creates a beautiful rainbow effect on the nail when light hits it. 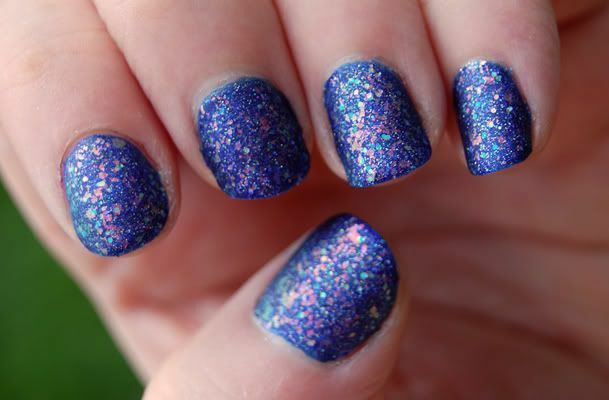 It's probably my favorite polish in my collection at this moment... that says a lot! 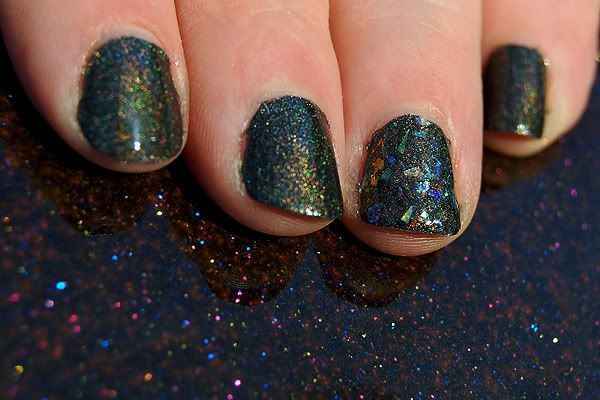 You can see Color Club Covered in Diamonds here trapped under a layer of Nubar 2010. 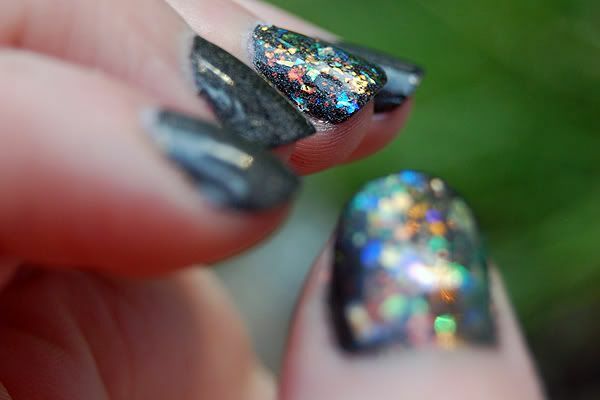 Both Covered in Diamonds and 2010 are iridescent flakie polishes, but they couldn't be more different. 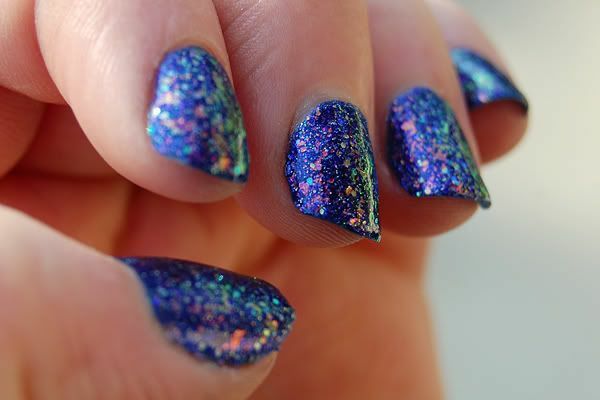 Covered in Diamonds is a rainbow iridescent flakie polish in a clear base, it's basically the nail polish equivalent of iridescent cellophane. 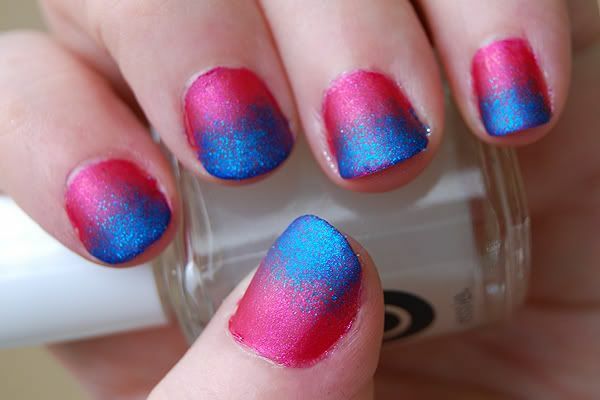 While 2010 is also a flakie polish in a clear base, it has an overall iridescence where has CiD is piece by piece... if that makes any sense. 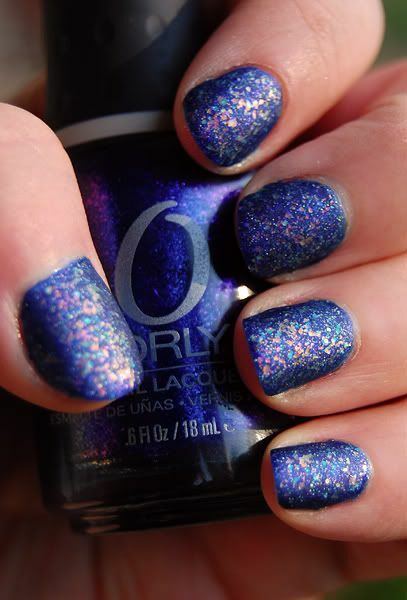 2010 is very similar to the discontinued Sally Hansen Hidden Treasure that goes for way more money than it's worth on EvilBay. It reminds me of glowing embers. 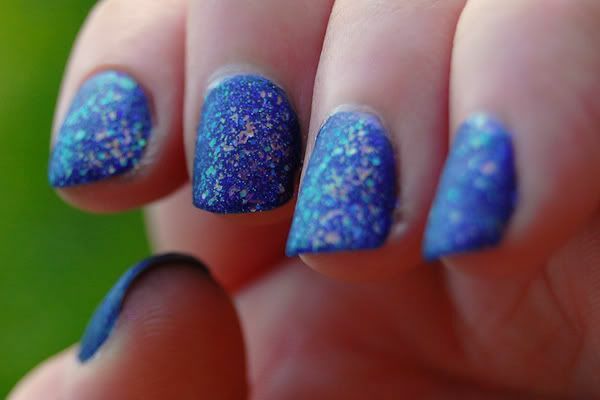 Unlike many flakie polishes, 2010 is very smooth to apply and leaves no bumps or upward jutting flakes. I was out running around the other day just to get out of the house, so I popped into several beauty supply stores. While I was at Beauty Brands, I noticed an entire display of a single polish, naturally I had to take a look at it. 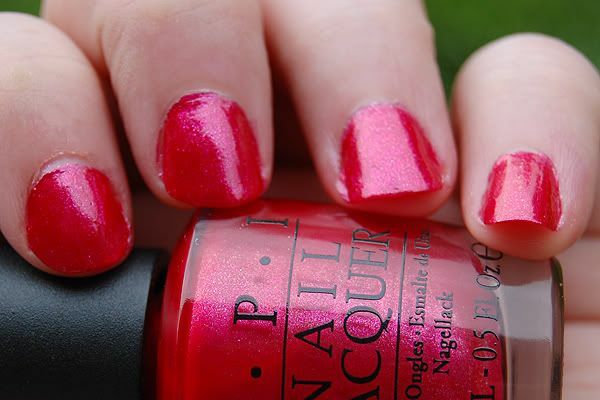 What I found was the Beauty Brands exclusive OPI shade, Teeny Weeny Pink Bikini. I couldn't decide if I had anything too similar to it, so I left it there. After checking my stash, I decided to head back today and pick it up. I'm glad I did! 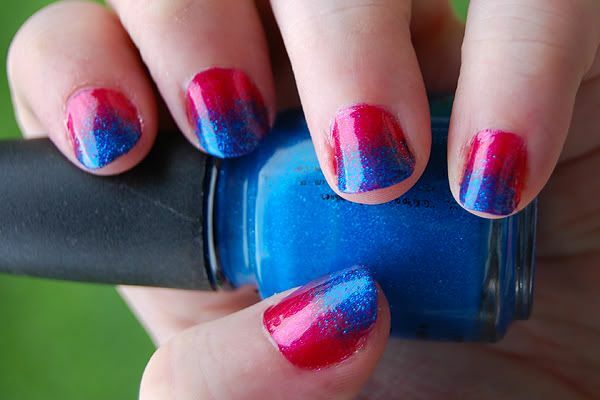 Teeny Weeny Pink Bikini is a hot pink polish with fuchsia and pink glitter. 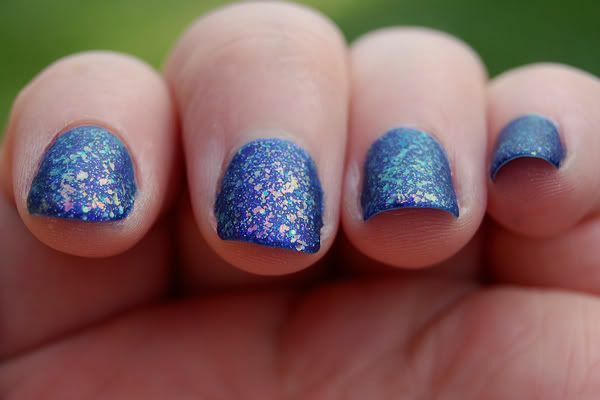 Like most OPI shades, it's highly pigmented and has a smooth formula. I'm a little obsessed with gradients right now, so I sponged on some China Glaze Blue Sparrow and Frostbite, which turned out really nice. I also picked up Essie Matte About You while I was at Beauty Brands, and I decided later in the day that I might as well try that out too. I'm really pleased with the end result... well, aside from the fact that my nails are jacked and I ran out of q-tips and couldn't clean up my mani! Haha, oh well! So it seems like I've been spending more and more time on Blogger looking at nail and beauty blogs, some of my friends even run their own, so it's only logical that I get in on the shenanigans, right? Right. Well, because it's just my luck, I managed to completely destroy my left thumb and pointer nails at work not twelve hours after deciding I was going to start a nail etc. blog of my own, so I'm afraid it will be a bit before I can start posting any NOTDs. However! Considering my long, voracious love affair with eyeshadow, you can fully expect some FOTD/EOTDs in the mean time.